Agents of Treachery by Otto Penzler, editor, a Mysterious Review. 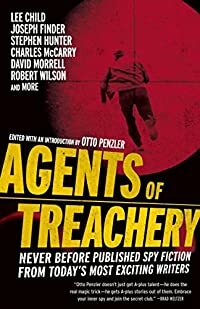 Review: In editor Otto Penzler's introduction to Agents of Treachery, he writes that a collection of original stories devoted to espionage thriller or international adventure has never been published. Well, now it has. Some of the genre's best have contributed short stories to this collection, including Lee Child, Joseph Finder, Stephen Hunter, and many more. There are 14 stories in Agents of Treachery, and it will come as no surprise that they are as varied as the authors who wrote them. Some are better — some much better — than others, but all are certainly worthy of being included here. The common theme is generically "spy fiction", as it says on the cover, and while all the stories have some covert element to them, whether it be from the plot or the characters themselves, it's probably a stretch to say all include "spies". Still, fans of the genre will be pleased by the variety of subjects examined by the authors. If just one story had to be highlighted here, it would have to be "Section 7(A) (Operational)" by Lee Child. Written with a hint of whimsy and an eye towards the unexpected, it is also the shortest, at a mere 10 pages in length. It clearly illustrates that a story with distinctive characters and a plot with a twist doesn't require a protracted backstory or an intricate setup to be memorable. Acknowledgment: Random House provided a copy of Agents of Treachery for this review.